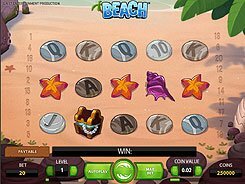 Beach is a beautifully designed summer-themed slot featuring five reels and 20 fixed paylines. Every time you click the Spin button, a gentle wave comes ashore, then it moves back toward the sea leaving symbols on the sand arranged in 5 columns and 3 rows. The symbols are various shells, starfish, a treasure chest, a bottle with a message inside, and flat round pebbles with playing card values from 10 to A printed on them. 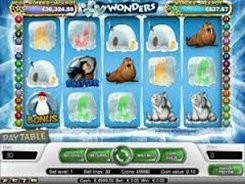 Before any spin, or a wave as they have named it, you can adjust the following settings: a coin value ($0.01 to $1), and the number of coins per line (1 to 10), so the minimum and maximum bets per wave are $0.2 and $200 respectively. The top jackpot prize of $20,000 is awarded for hitting five Treasure Chest symbols across a payline. Three or more scatters (Bottles) appearing in any position unlock 8, 16 or 24 free waves. Along with a regular wild symbol that substitutes for other icons, the slot features an Octopus Wild that lands on the central reel only and has the same ability to substitute as a regular wild. Besides, an Octopus Wild can swap the positions of two adjacent symbols to create a winning combination.